After her self-defense lesson, from some student who clearly doesn’t know what he’s talking about, Becca walks towards her car. Only to find two men beating another one. To help the man, she drives her car at them, which, luckily, makes the two guys run. She runs as fast as she can to the victim, who’s lying on the ground. Afraid they’ll come back, Becca pushes Chris in the car and races off. When she offers to take him to the hospital, he refuses. Instead he gives her the directions to his house and passes out once again. Fortunately his house isn’t that far away and easy to find. The hardship comes the moment she rings the bell and the door opens to show a very grumpy man, who obviously is Chris’s brother. The way he treats her is even worse and he even threatens her after he carried Chris inside! And he attacks her in the garden! Luckily she wins this one, also because of her self-defense lessons and runs away. What she doesn’t know is the good deed she did today, although his brother obviously didn’t appreciate it that much, has very big consequences for her and the brothers…..
There’s only one thing that disappointed me a little bit. 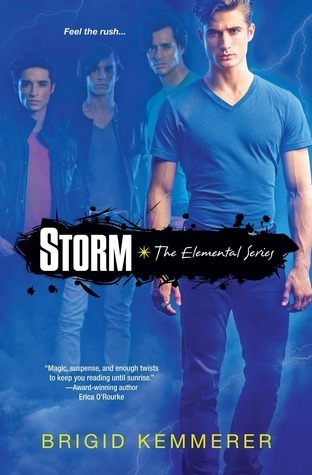 Although Storm is a sequel, it starts a couple of years after the cliffhanger in Elemental. So much happened in the meantime, I’d much preferred to have finished Michael’s story first, although I was a little shocked after I found out what exactly happened in the years between. It helps explain how Michael made such a huge change for the worse, but at the same time I wasn’t that happy with it. I hope he gets another chance in his own (full, Elemental is an extra) book. I do recommend everyone to read Elemental first, it explains the entire situation a bit more and gives a glimpse of what happened in the past. 5 HEARTS. It’s just not possible to give this book any less. It has lots of my favorite things: Elements, Romance, Good Story and Delicious Hunks ^^ Besides reading this story makes you want to read more and find out more about the brothers and their magical world. I can’t wait to get my hands on Gabriel’s story!